We first began warning clients of market overvaluations nearly three years ago (May 2014). At that point, we began moving tactical clients into more defensive positioning, while reducing expectations among fully invested clients. Since that time, most asset classes have indeed declined, some massively….which we have highlighted in our quarterly blog posts since then. The most recent asset class to fall (US fixed income). 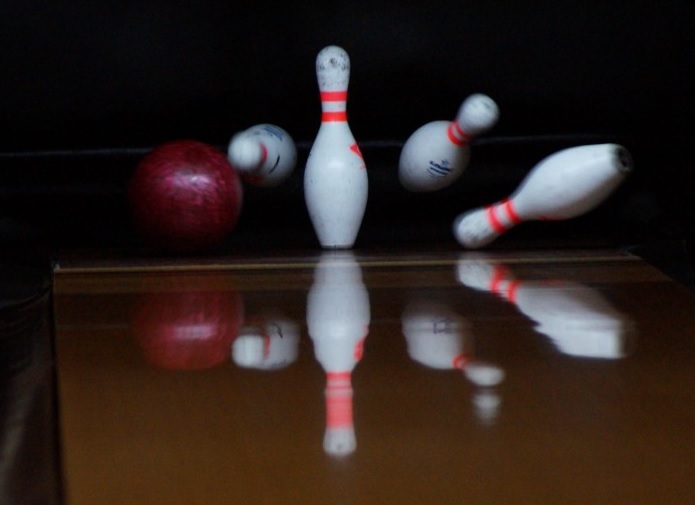 “The Last Pin Standing,” our good ‘ole, home-cooked, US equity markets. Our current game plan, and the opportunities that lie ahead. Until recently, only US markets (both equity and fixed income) remained in positive territory, albeit moving further into severe overvaluation. In Q4/16, the US fixed income market began to decline as well, as interest rates finally started to rise from lows not seen in the last 100 years (see Chart II below)! While fixed income could moderately bounce higher from recent lows, more pain lies ahead as the Fed normalizes its extraordinary low interest-rate policy of the past 8 years. What is truly sad is that “common practice” investing suggests heavy fixed income allocations for older and more risk-averse clients, confusing low historical volatility with the current bubble situation that exists. …and we also believe that the pain is far from over as this bubble continues to unwind. For seniors who are already struggling on a low fixed income diet, they are now seeing their principal eroded as well. While 4 of 5 major markets have fallen or started falling, one still remains: US equity markets. US equities have so far been resilient to overvaluations, the beginning of Fed stimulus removal, a tumultuous US election, and numerous other potential bubble-bursting catalysts. While gains haven’t been earth shattering, they have averaged a positive 6% annualized for the past 3 years, besting all of their peers who have negative 3-yr returns. However, this continued rise has been on the backs of a declining profit picture, which further exacerbates the valuation bubble. As we have said before, full market cycles are always completed and the US bull market will not be permanent…it never is. This time is no different…and in the end, excessive valuations will bring share prices back down to earth. Chart III below is an update to one of our favored valuation metrics, the Shiller PE ratio, which is 93% correlated to 10-yr stock market returns (and is currently 75% overvalued)! 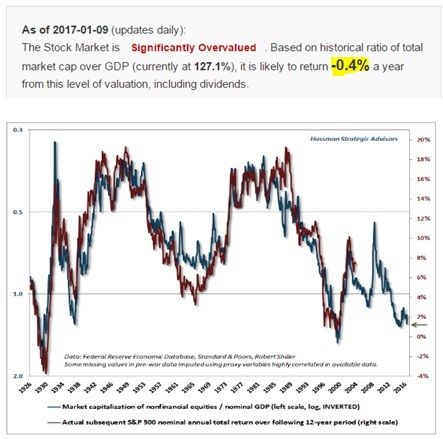 We have also updated our Market-Cap-To-GDP ratio, a Warren Buffet favorite which suggests negative returns of -0.4% annualized for the next 10 years (chart IV below). As we have highlighted before, the risk required relative to the potential reward just does not make sense in US public investment markets. While there may be more gains to eke out in the near-term, investors are faced with potential 40-50% declines on the risk side, with -0.4% return expectations as a reward. These imbalances are so large, that remaining long in the US Markets is highly imprudent as a tactical investor right now. Again, this doesn’t mean it can’t still go up a bit more…as it did near the end in 2000, 2007, and previous bubbles. We are once again seeing this irrationality, with valuations now more expensive than only two other times in all of measured US history! We warned of this in US fixed income markets at beginning of last quarter, and they began declining in Q4/16. We again warn of the massive overvaluation in US equity markets, and while we do not know the exact timing, we know that the current reward to risk just makes no sense at all. As we have suggested previously, fully-long index investors should expect muted returns in the 10 years ahead. Additionally, they should expect a major bear market or two at some point in between. Looking out further to 20-30 year projections, the numbers begin to improve a bit, but still remain below historical averages given the high valuation starting point of today. Conversely, our tactical risk-off clients should avoid the majority of bear markets, as they already have outside of the US and in commodities. This loss avoidance will allow tactical clients to reinvest dry powder once valuations come back to reality. Bear markets not only bring valuations back to normal, but typically they overshoot to the downside, offering patient investors fabulous entry points with their cash. See, the part that is rarely written about in mass publications is that public market investing is not a straight line proposition with consistent returns year after year. Instead, it comes in fits and starts, and is very choppy in nature. Warren Buffet knows this secret well, and is now holding nearly $90B of cash, sitting out the last few innings of the US bull market, and preparing for the inevitable decline. Now is that an easy thing to do while others chase the trend? No, it is natural to feel uncomfortable about “missing out,” or to question whether it is the right thing to do, or to even be impatient and discontent. That discomfort is the price an investor has to pay to generate out-sized long-run returns…nothing comes for free, and to the most disciplined investor go the spoils. Now, on the bullish side, while the pickings remain slim, we are in fact starting to see a few more areas where valuations have declined enough and technical indicators suggest a reasonable entry point. 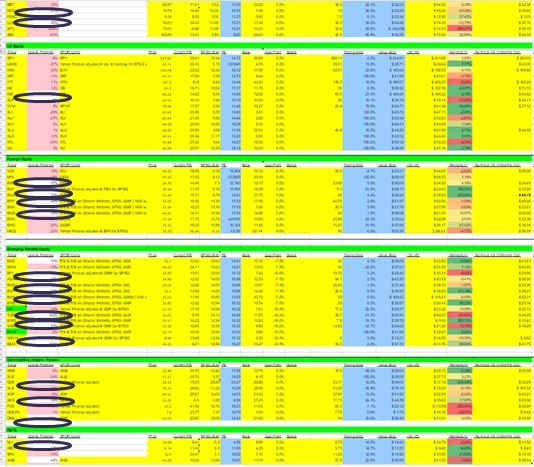 Chart V below is intentionally blurry as it is confidential, but the various ellipses illustrate possible investment areas that have become more reasonably priced. We are seeing opportunity in select emerging markets, a few commodity markets, oil pipelines, and some high-yielding real estate sectors…and have slowly been increasing our risk-on allocations to these areas. We also continue to find attractive opportunities in our private market investing for accredited clients (Lotus Club). Given liquidity and regulatory constraints, we are finding very low multiples on purchase prices, and very high yield possibilities on debt instruments with high covenants. Over 25% of client assets are now allocated to this private space, with a 20%+ increase in allocation during the last quarter alone! However, we still recommend keeping some liquidity in public markets as deeply discounted opportunities have been emerging, and often do so quite rapidly. Being able to pounce on these opportunities will inevitably materialize once the next bear market appears, and will highly jump-start returns in the non-linear fashion discussed earlier. Thank you again for another year of working together, for maintaining your discipline, and for truly working towards greater success in your life.